Smart technology and smartphones have come out in full force over the last twenty years. Most smartphones come with a camera onboard and with all these cameras people are taking more pictures than ever. Responding to customer demands cameras on smartphones have been steadily improving and people are taking more creative pictures and videos in many new ways. Virtual reality has been gaining steam after a slow start and the demand for 4K 360 degree video is increasing every day. With this increased demand for 360-degree video, a number of manufacturers are creating brand new cameras that film in 4 K 360 and are operate with an app on your phone. There are many to choose from and prices can start as low as $100 and go up in price from there. Features and picture quality improve with price and at around $300 to $400 you can get something with decent quality and features. The new GoPro Fusion is one of the best quality 4K 360 video cameras in its class and is priced at $699. The picture quality is excellent but there have been a number of issues with the post production software that makes it difficult to work with and somewhat unreliable at the moment but once they get the bugs out it expected to be a one hell of a camera. 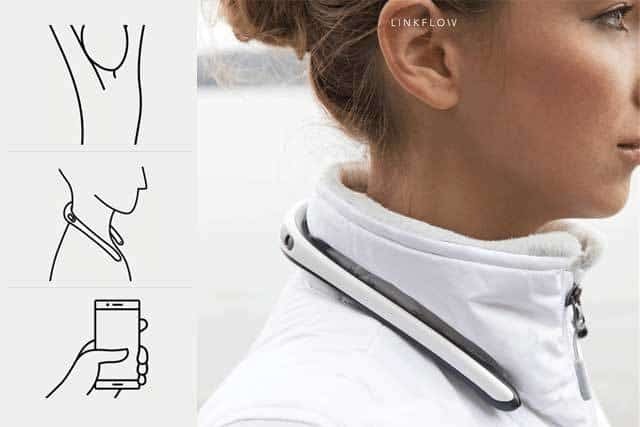 The new FITT360 wearable camcorder by Linkflow is the first neckband 360 cameras. You wear it around your neck and you can capture vivid 360-degree video hands-free. This is a great new way to film in the first person. They are currently at the crowdfunding stage and have 990 backers and raised $381,496 to get production going. Expected delivery in October of 2018. The FITT360 is priced at $370 during their Kickstarter campaign and looks to be set to retail at around $600. Let's have a closer look with my FITT360 Wearable Camcorder Overview. They designed the FITT360 camcorder to have a number of great features but yet make a lightweight device that is not bulky and easy to use. Start and stop recording controls are located near the left tip of the FITT360. It has three cameras for full 360 degree coverage. From video example I have seen, I think they need to improve the video quality if they want to keep it at the $600 price. At that price there are better 360 cameras on the market that produce a better picture and you are just $100 shy of the GoPro Fusion compare videos below and a much more versatile camera. You can take pictures with their Quick Capture or stream live via Social Network Sites and share live videos with family and followers. With a pair of Virtual reality Glasses, viewers can see a video in 360 footage or in single video option for conventional viewing. If you have an elderly friend or relative that cannot get out much the FITT360 is great a way you could share your vacation in live time and have them feel like they are there with you. Footage can be viewed on a regular screen or with VR glasses for a full 360 experience. The FIT360 also is a Bluetooth headset. That can be used to listen to music when you are not recording video and can be used to take hands-free calls. Keep in mind you only have 90 minutes of battery time and your battery may be dead when you want to video something interesting. 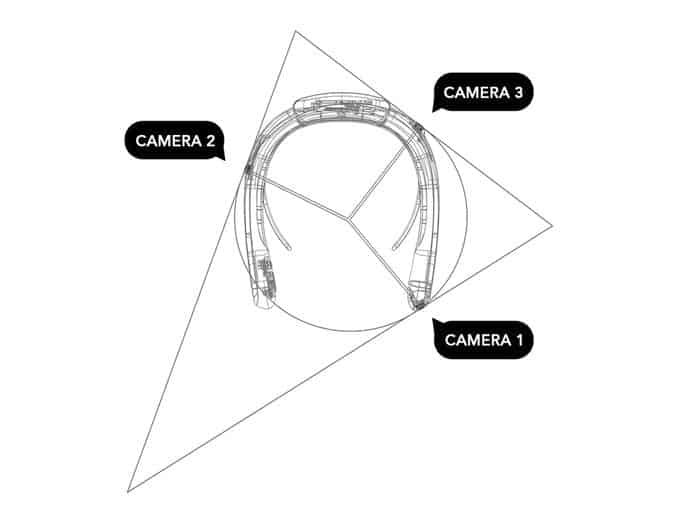 The FITT360 comes with a companion App to compensates and normalizes the exposure and auto-stitches all three clips together, minimizes shaking and automatically makes the clip VR-Ready. Files can be exported as a full 360 degree image or a a single image in full HD. Heat Proof. They designed it so the heat form the unit dissipates away form your neck. This keeps your neck from getting to warm. IPX6 Water Resistant. It is not designed to go under water but it can handle a little splashing and is protected from powerful water jets. The FITT360 comes in three different sizes small, medium and large to insure a proper fit for the user and it will be available in three colors silver, red and white. The FITT360 was designed as an ideal companion to take on a trip or when hiking. With the FIT360 around your neck, you are always ready to video or take a picture. Unlike a conventional camera, the FITT360 is not as intrusive and people will forget that there is a camera recording. It does have the addition of Bluetooth capabilities so you can listen to music but with its relatively short battery life, I can't see using this feature very often. New wearable technology is appearing every day and the around the neck design makes it easier than mounting a camera on your helmet to capture 360 degree videos. Just put it around your neck and you are ready to go. The FITT360 is another interesting new entry into the 360 camera market. I think once it gets to market if they could extend the 90 minute battery life and drop the price it will have its place for many people that would like to capture video in a 360 format. Support their FITT360 crowdfunding campaign and get one for a limited time for $370.